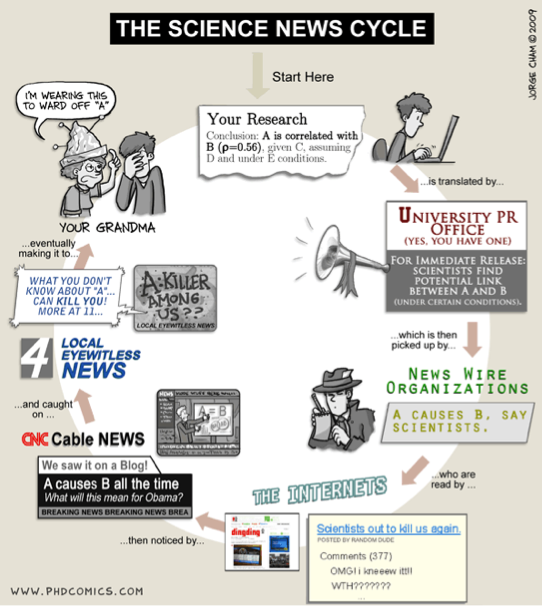 Home » Opinion, career insights and more » Who’s to blame for faulty science reporting? Last week Frontiers attended the seminar “Selling science? News, public relations and communicating scientific research” organized by PHG Foundation in Cambridge. It was there that we had the pleasure to meet Dr. Andy Williams, lecturer at Cardiff School of Journalism, Media and Cultural Studies. Dr. Williams was previously the RCUK Research Fellow in Risk, Health and Science Communication (2008-10). His current major research interests relate to news sources and the influence of public relations on the UK media, especially in the area of science, health and environment news. In the seminar, we were enlightened by the fast paced and under pressured environment which journalists live under and how this impacts science. Journalists are pressured to publish a great volume of news in a short period of time. The amount of news they need to publish sometimes does not allow them to double check sources and in the end of the day most of them come from other news or press releases. Most of the time, they try to simplify the news for media consumption, which dumbs science down, and in some cases miscommunicates it. This can lead to serious complications when they pass this research onto the lay public (their audience). Faulty or miscommunicated information can generate wrong decision making on lifestyle, vaccination and nutritional choices. But journalists aren’t the only ones passing along misleading information. A new study suggests that a lot of the hype comes from academics themselves as many press releases contain exaggerations. Researchers looked back at all health-related press releases issued by 20 major UK universities during 2011. They found many false health news reports were based on misleading press releases – normally part written, or at least approved by, the scientists themselves. For example, 36% of press releases they studied made exaggerated claims about human health from research actually carried out on animals. So, exaggeration in news is strongly associated with exaggeration in press releases. Improving the accuracy of academic press releases could represent a key opportunity for reducing misleading health related news. The study essentially asks who’s to blame: Is it the journalist’s fault for not bothering to read the actual studies they are reporting on or the academic press releases for hyping results? Or is it the fast paced culture in which the amount of content produced is seen as more important than its quality?